For thie next few weeks, as part of the #5WomenArtists campaign, we're discussing areas of the art world that women artists are leading the way in defining what this type of art means in a contemporary context. Each week, we'll dive into a different area and pick five women artists we love that explores it in her work. To start, we're taking a look at textile art. We focused on this for our group show, "Following The Thread," last summer that featured our artists like Debra Smith and Emily Barletta, and now we'll open that up to the art world at large. Pia Camil is a Mexico City-based artist that turns to her urban and industrial surroundings for her inspiration for sculptural and installation works. In "Bara, Bara, Bara" (bottom picture), she deconstructed and sewed together T-shirts that had been manufactured in Latin America, sold in the U.S, and then ultimately purchased in the bargain markets of Mexico where they ended up. 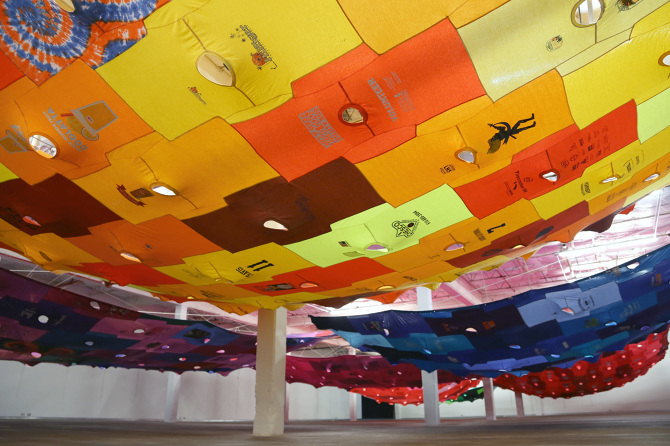 Aesthetically, the canopies that these structures form resemble the Mexican markets, and ideologically they're a commentary on the meaninglessness of borders as demonstrated by the trade path these shirts have taken, and the interconnectedness that consumerism results in. In "The Little Dog Laughed" (top picture), she stitched together dyed fabric and canvas into works that reduce the architecture of the city into geometric abstraction. The curtain also references the domestic realm. In all of her textile work, there is an emphasis on the artistanship of constructing each piece as a means to decelerate consumerism. 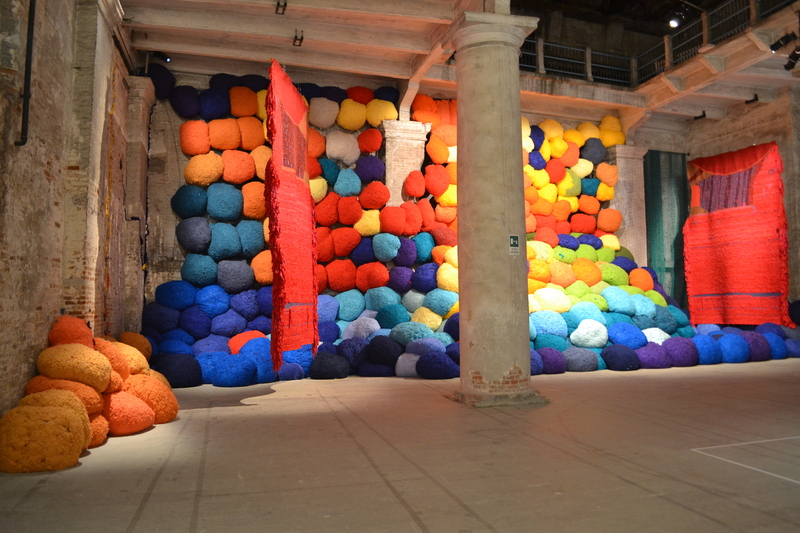 Sheila Hicks is a pioneer of fiber arts being embraced by the fine art world. Her work pulls from a vocabulary of traditional textiles from around the world. 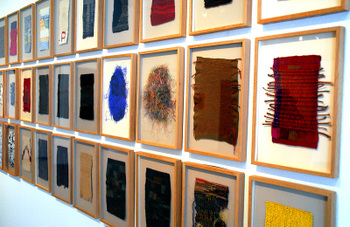 Her weaving (bottom picture), which she refers to as "minimes," modernizes the traditional form with experimental textures, materials, and use of color. But she is best known for her installations, like at the Venice Biennale in 2017 (top picture) that deconstruct textiles and create bold sculptures from their materials. The large pieces playfully transform the space and upend the way we investigate what we typically encounter on a smaller scale. 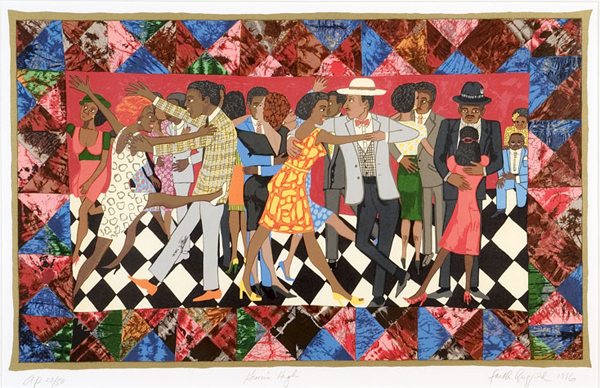 Faith Ringgold creates painted narrative quilts that depict stories from throughout African American history. Quilts have always been used as a means to tell stories, whether they're of an indivudal family or of a culture as a whole, and Ringgold doubles-down on this tradition by painting stories on them that she has fought to center in our nation's narrative through her lifelong activism for civil rights. Their faux naive style is a nod to the democratic accessibility to quilts as a storytelling forum, an artistry that has been utilized by women of the most marginilized communities all the way up through the aristocracy. Olek takes one of the skills that has had the most difficult shaking its association with craft, crochet, and uses it to create counterculture works that buck convention and spread political messaging. Often exhibited in the guerilla tradition of "yarn bombing, Olek's pieces upend the traditional boundaries of the art world. Her yarn suits and sculptures focus on outrageous aesthetics, while other projects like "Our Pink House" (top picture) revel more in the tradition of crochet itself. In her site-specific installations like covering an abandoned house in lacey pink Granny squares, she gathers together a group of women from that community to create the piece together, and the final piece is as much about the communal nature of women bonding over this historically feminine skill as it is about the work itself. Billie Zangewa creates silk tapestries about the female experience, often depicting scenes that center around domesticity and family. Primarily autobiographical, her work explores questions of identity and representation of women of color. The rich textured surfaces are incredibly painterly, particularly for how she treats skin and clothing. She embraces the femininity of working with textiles, and doesn't shy away from the associations silk has with fashion, glamour, and luxury. 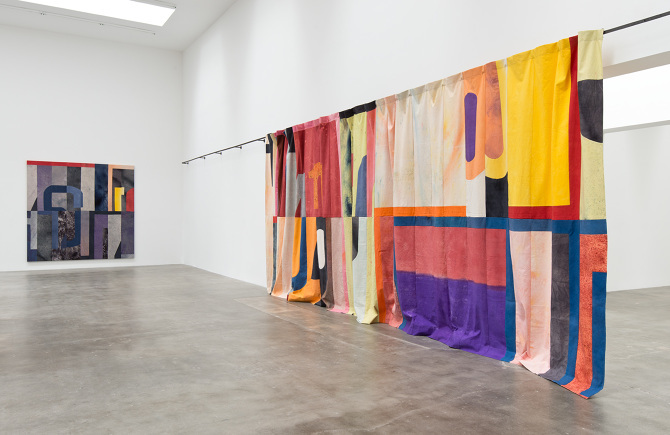 Yet, the uneven edges of some of her works that makes the silk painting appear to be a survivor of an attempt at destruction nods to the fact that these are typically outlets for escapist fantasy from a life filled with difficulty.